Even writing this brief heads up, I feel melancholic about Saturday’s bout. 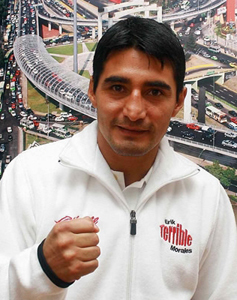 Morales is offered the chance to become the first Mexican to claim a portion of the World title at four different weights. More likely? The fresher Diaz will pound the gutsy Mexican into retirement. A professional since he was 16, Morales has fought a catalogue of outstanding fighters and illuminated the divisions he’s graced with his trademark expressionless face and an unconquerable spirit, now 30 – and with a lot of punishment absorbed – the end is surely nigh. Four defeats in his last five fights, evidence of the decline from his illustrious and fearsome prime, a purple period of around six years through which he tangled with and beat Barrera, Chi, Ayala, Kelley, McCullough, Jones and Zaragoza across two divisions. Morales became one of the most feared fighters in boxing, a hero to his Mexican people and a major television attraction. Nostalgia rarely prevails over form though and Morales looked old in recent bouts – savaged by a rampant Pacquiao, made to look ponderous by Zahir Raheem – Morales must know the clock is ticking and that even the WBC’s generosity cannot extend beyond this underserved shot.As he walks toward the ring Saturday night, I’ll be watching thousands of miles away and I’ll have that awkward, uncomfortable, sinking feeling. Similar to the one we all feel when we’re late on a deadline and the boss is calling. You know what lies ahead. Morales, sadly, looks way past the deadline too. Click on the t-shirt to access the Erik Morales tribute shirt at the BoxingWriter T-Shirt Shop – USA. Morales gave it his best shot but his body is too battered. He is one of my favorite fighters. I think he made the right decision to retire and I hope he stays retired. He has contributed a great deal to boxinghis battles against Barrera and Pacquiao. He should not gamble with his health because he has taken a lot of punishment in his boxing career. David has now proven himself as as the champ. I can’t wait to see him fight again. Ive just got a feeling….